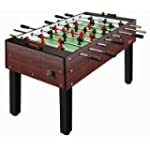 If you miss getting in some foosball games in your free time, then you might be interested in adding one of these affordable foosball tables to your home or office. There are a lot of cool models on the market right now and these things are a great investment since you get several years of use out of them. Plus, the really high quality ones have a good resale value for when you decide that you no longer want it. Since there are so many models to choose from, we’ve compared them all and narrowed it down to our top 10 picks. We update this list regularly, so if you’re just doing a bit of early research before shopping, we suggest that you bookmark this page so that you can refer back to it once you’re ready to buy. The high quality Carrom 530.00 offers a lot of value for the money. It is well-built with quality materials that make it both durable and sturdy. 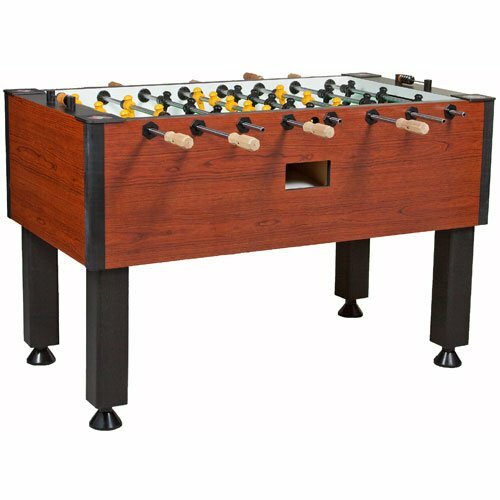 That makes it one of the best family foosball tables on the market right now. Carrom actually makes this table, and a few of their other models, in colors other than the one that you see in the image. In fact, there is one model with a green finish that is pretty cool looking as well. With the Carrom 530.00, you get hollow steel playing rods for some of the quickest game play, as well as premium bearings that ensure you’re getting the fastest and smoothest spins. A really nice feature of the Carrom 530.00 is that it helps you to answer that age old question – foosball with one or three man goalie setup? With this model, you get to choose because it supports both configurations. We suggest you go with the single man goalie setup because it requires more skill, however kids do find it easier to score with a three-man goalie configuration. 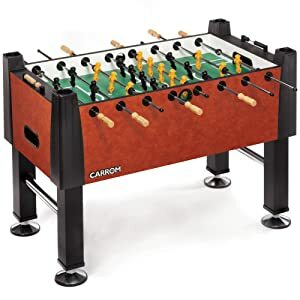 Overall, the Carrom 530.00 offers a lot of features, like built-in leg levelers, for an affordable price that makes it one of the best foosball tables under $1000 right now. 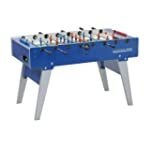 In recent years, Hathaway has managed to build a pretty strong reputation when it comes to good, cheap foosball tables with a price under $800 at several online stores. And this Primo model is one of the best ones that they make right now. Sure, it is not the same quality as the Carrom model up above or any of the other more expensive models on this page, but for the price you get a pretty great table here. As you can tell from the photo, this thing looks great – it has a deep espresso finish that gives it a very modern and luxury feel even though the cost is very affordable. It is actually something that you will be proud to show off in your home, but it is also cheap enough that you can just stick it in on of the kids rooms. You get a surprising amount of features for the money with the Hathaway Primo model. The MDF butcher block-style cabinet is supported by stable legs that have built-in levelers. The playing rods are solid steel and feature EZ spin bearings for quick game play. Plus, the players are counter balanced, which is definitely a must-have feature. For the price, you really can’t find a better table right now. So, if your budget is tight, definitely order the Hathaway Primo for your home game room. This right here is one of the very best options on the market right now if you are looking for something that is professional level. 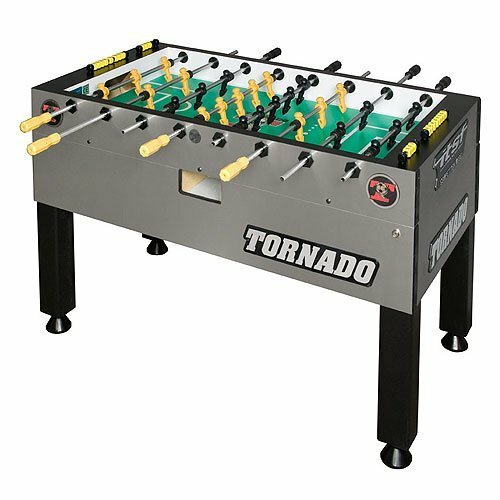 The Tornado Tournament 3000 is a commercial grade foosball table that is one of the most heavy duty and durable that you will find. The Tornado Tournament 3000 has a single-goalie setup, just like the pros use. And at 355 pounds, this is a beast of a table – so make sure that you have some friends on hand to help you set this thing up when it arrives. The playing rods are hollow steel rods, but they are even better than most because they have been heat treated to give them even more strength and even faster spins. So, your game play will be at its best when you play on the Tornado Tournament 3000. And, of course, you get Tornado’s patented counter-balanced players on those rods. The Tornado Tournament 3000 is actually the official table of the Tornado National Tour, which tells you just how awesome this thing is for game play. If you really love the game, then this table is really the only choice for you. This is another good option in the under $1000 – $1500 price range if you’re looking for something that has a bit of a classy look to it. One thing is for sure, the Shelti Foos 200 will look great with the rest of the furniture in your home. 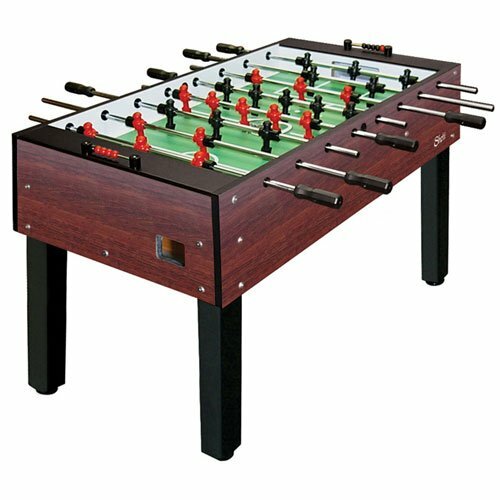 At 215 pounds, you will probably need to have a friend available to help you get the Shelti Foos 200 all set up and into place in your home game room. It weighs so much because it is built with very high quality materials. In fact, the cabinet is made of solid wood that is wrapped in the dark vinyl for a pleasing appearance. And the sturdy legs have built-in levelers. The Shelti Foos 200 does have counter-balanced men on the chrome plated steel rods. Also note that this one does have the three-man goalie configuration. 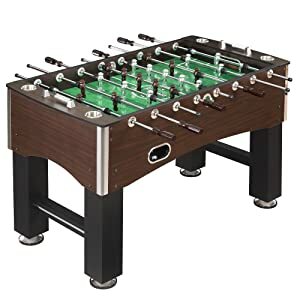 That makes this a good family foosball table since it will be easier for the kids to play as scoring with a one-man goalie setup requires more skill. Overall, I think you’ll really enjoy the performance of the Shelti Foos 200 as well as how great it looks with the rest of the furniture. The Rene Pierre Champion Foosball Table doesn’t have the same style and design as most of the foosball tables on the market, but that is part of its appeal. It has a very retro design to it and it almost looks like something straight out of The Jetsons. 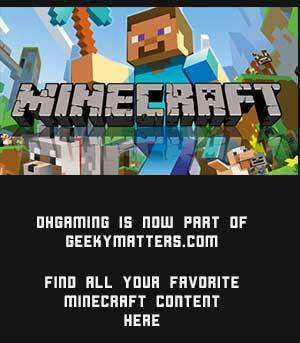 And it just happens to be very well made with high quality components that give you great game play. This is a full size table, which you might not be able to tell from the design and shape in the photo. And it weighs around 200 pounds, which means you’ll probably need someone there to help you set up it and get it to your home game room. The cabinet is made with commercial grade MDF so that it is extra durable. The legs are very thick for stability. And there is even a cross panel for a little extra stability. It does have a single-goalie configuration and the men are counter-balanced on chrome-plated telescopic steel rods. Overall, this is a great choice if you want something in the French foosball table style. It is very quirky compared to most American tables and definitely a cool piece of furniture. Expect it to be a definite conversation starter when you have friends over. It is definitely one of the coolest options on the market right now. Like everything that Tornado makes, this is one very high quality gaming table. But like most things with high quality, it is not cheap. 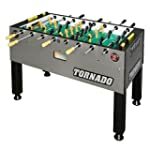 But, if you are a serious fooser and want a serious table, then the Tornado Elite is a good choice in the under $2000 range – and it is cheaper than the Tornado Tournament 3000 at Wayfair. With this one, you get all the quality and great features that you have come to expect from the Tornado brand. It has the Tornado patented counter-balanced players, heavy gauge steel rods, commercial grade leg levelers, solid wood handles and that made in the USA quality construction. This makes a great choice for families if you want to invest in something that is very high quality that will last for many years. Plus, all the Tornado tables have a good resale value for when you no longer want it. At the end of the day, the Tornado Elite is definitely one of the best options on the market, but due to it’s price it is not a good choice for everyone. It is a good choice for you if you expect to get in a lot of game play and you want something that will last longer than the other brands out there. 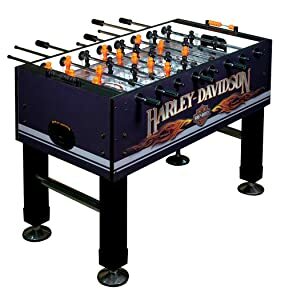 If you are a fan of Harley Davidson, then there is really no better option for you than the Carrom 753.75 Harley-Davidson Foosball Table. 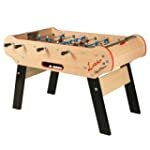 This thing is definitely one of the coolest foosball tables that I’ve ever seen, and there are a lot of novelty design foosball tables on the market right now. One of the things that is so great about this one is that you get that quality and affordability that Carrom is known for when it comes to gaming tables like this. The design of the cabinet is very heavy duty with sturdy legs and chrome-plated leg levelers. The solid steel rods are triple plated for strength and feature professional style weighted players for better game play. And the handles on the rods are solid wood, just like with the Tornado model above. Overall, this is definitely an awesome choice for anyone who is a fan of Harley Davidson. Just remember that this is an indoor table, so you can’t leave it in the garage or it might get damaged from humidity and temperature changes. If you don’t have a lot of space or just don’t plan on playing the game very often, then the Garlando Master Pro is a good choice to consider. 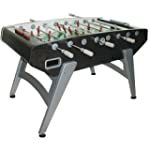 Right now, it is the best folding foosball table on the market when it comes to quality and price. With the Garlando Master Pro, you get that quality that Garlando is known for when it comes to gaming tables like this one. The durable MDF cabinet and legs are coated with melamine to reduce the chances of scratching or damaging the table when you are moving it or folding it up. The telescopic steel playing rods are rust resistant and feature steel roller ball bearings for quicker game speed and less stress on your wrists. The play area is tempered glass and the entire table is covered by a 2-year warranty. And, of course, the legs fold up for easy storage and transport. Overall, if you really need a folding table, then the Garlando Master Pro should really be your only choice. Compared to all the other folding models, this one is much better quality and has a better price.